Are long fingernails on men stylish or symbolic of something? I’ve always noticed some men in Taiwan (and I guess in other Asian countries also) like to grow their fingernails long, and have dismissed it because I didn’t know many of these guys. Perhaps they were guitar players or something. Lately this boy I’ve been tutoring since he was quite young has started growing his nails out. He doesn’t play the guitar or need long nails for any particular reason, but perhaps this is what he sees his junior high classmates doing. Is this a style? It’s not just his pinky either–he’s growing them all out. Looked elsewhere online, and couldn’t get very good answers. Damn curious though. Some of them use the long nails (especially little finger) to clean gunk out of their ears. Asians have different earwax to Caucasians. Theirs is drier and needs to be cleaned out. Often it’s only the pinky nail. Like mole hair I find it rather repulsive. Wow Teggs. I never realized Asian earwax was drier. Longer, curved nails would be quite useful for scraping annoying stuff out of there. I did just find this rather useful and humorous video about ear wax differences on Youtube if you’re interested. Interesting question, chalouie. Guitar players in general don’t need longer fingernails; generally only we classical guitar players prefer those, but that is identifiable by the slightly longer nails on the right hand, and very short ones on the left, as white fingernails on the left (assuming the guitar is not oppositely strung for a lefty) interfere with fretting. Also, “long” is generally quite limited in this case, to a few (.5 to 3) millimeters of white, as opposed to no white, with slight variations between fingers. A few players will go slightly longer and reinforce them with layer upon layer of polish, sometimes yellowing with time; they may have very veiny, sinewy hands. More often you are likely seeing a long pinkie nail for picking ears, or long nails in general as some kind of local metrosexualism or something else. Other clues such as whether they have snakeskin shoes and bouffant hairdo’s or a betel nut habit may help in your vital quest to identify the source of this idiosyncrasy. I’ve heard that if a guy’s pinky is shorter than the first crease? on the ring finger, then he’ll get dominated by his wife. That’s why guys grow the pinky nail. That and to pick their nose and ears. Good information Dragonbones. Thanks. Hadn’t thought of the metrosexualism, but do recall some press about more and more men getting manicures. Perhaps that could be it, but it does seem to be predominately older, more traditional-type males not fitting any other particular category. But that’s just from my limited perspective. I don’t get out much either. Kaikai, that’s wild! Where did you hear that? If it’s a local superstition, that’s unbelievably interesting. Thanks for the info! It’s just specific cultural example of foppish priggery. 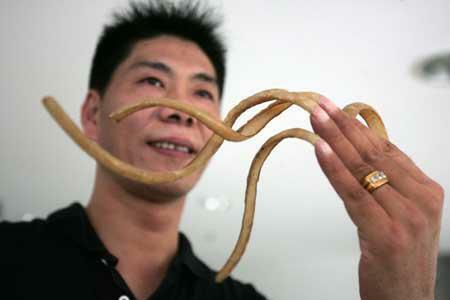 Long nails on men in Chinese culture designated the wearer as a non-laborer. In fact, if you had really, really long nails, it meant that you could feed yourself without picking up chopsticks: just like mamma’s little baby. A retinue of slaves would surround you to bathe and feed you. Western prigs displayed the same behavior in other ways, such as wearing powdered wigs and such. That’s good stuff Charlie, and it makes total sense. I’m at peace with my question now. Thanks! [quote=“chalouie”]Good information Dragonbones. Thanks. Hadn’t thought of the metrosexualism, but do recall some press about more and more men getting manicures. Perhaps that could be it, but it does seem to be predominately older, more traditional-type males not fitting any other particular category. But that’s just from my limited perspective. I don’t get out much either. I asked my one of my uncles here and that’s what he told me. It looks gross and low class to me. I cut my nails in the usual way that Western men do it, to the quick more or less. My wife thinks that’s unhealthy or something and protests when she sees me doing it. This seems to reflect some kind of Chinese medical superstition, like the thing about not cutting hair growing out of a mole. I can ask her why if you want. Oh dude, my granny used to have multiple 2-3" long hairs growing out of a mole on her face. She said it’s a wealth indicator. When it’s long, business is good. When it falls off, so does business. The Chinese/Taiwanese and their superstitions. Thanks again KaiKai34. Wow. Now I know. These people with long mole hairs are just waiting for their $. I’m curious of an equivalent western superstition that would be just as hard to handle for Taiwanese. I was just thinking that growing fingernails out could be some expression of individuality or form of rebellion for junior high school boys. As far as I know, most elementary schools in Taiwan police fingernails pretty closely. Perhaps it’s not as much of an issue in junior high schools?